These are the stories of a private animal rescuer. Wild Angels doesn’t discriminate based on size. Here’s the story. Last Saturday I did not have a yard sale at the shelter where my daughters work. It was unbearably hot and humid – heat index temp was over one hundred degrees. I told my daughters that I wanted to come early that day to the shelter and go through the boxes of holiday stuff stored in a big roll-off container. In December of last year, once the weather got too bad to continue my Saturday yard sales, we stored boxes and boxes of holiday stuff in this large container. When I mentioned going through those boxes, the girls said that somewhere in that large walk-in container, the metal walls must have rusted and made a way in for mice. They had been wanting to spend some time in there, pulling everything out and looking for the hole(s). So we decided that since I would be dragging out all of the yard sale boxes on Saturday, they would pull out the other things stored there, and the mouse entrance could be discovered (and hopefully repaired). My daughters and I are always on the lookout for nests of baby mice. We just assumed that somewhere in this large walk-in storage container, with so many great places to nest, there would be baby mice that we hated to separate from the mom mouse. We managed to get almost completely finished unloading the container when my daughters discovered what we’d feared. There was a nest of baby mice in the least likely of all places. There was an old bag of quik-crete that had been stored for so long it had taken on moisture and was extremely heavy. As the girls attempted to lift it, the bag broke open. And there, inside a bag of concrete mix, was a litter of baby mice. There was a shredded plastic bag in one corner. Apparently, mom mouse had chewed into the bag and then built a nest of plastic bag pieces before delivering her babies. The tiny mice were completely coated in the concrete mix. There were two things about this. One, once a nest is disturbed, the mom mouse might or might not come back to her offspring. Two, the babies were definitely not in a good place for when they started moving around more. It’s not like the girls could just leave the broken-open bag where it was and hope mom would come back (assuming she even would). The babies were now completely coated in this concrete powder. Younger Daughter and I looked at Older Daughter. Poor dear. There was only one thing to do. Older would have to take them. This was not good news. For the baby mice, it was their only chance. Still, being with mom mouse is the very best for the babies. It’s hard to keep baby mice alive once mom mouse is gone. For Older, it meant feeding every few hours around the clock. And like Older said, the chances were great that she would lose them after several days of constant care. Always, wildlife babies are better off with mom. I hated this for Older Daughter. She was back to having all night to sleep now that her Spring wildlife babies were all growing up. And the sacrifice would be fine if there was a good chance she would save them. But it was unlikely that these little creatures would make it. The thing is – what else do you do? So she got them bathed (had to get the concrete powder off of them) and got them warmed up. She’s been feeding them every few hours ever since. If they survive until their eyes open, she will have a better chance of saving them. They will slowly be able to start feeding themselves. I asked Older about the baby mice last night. She said that after she feeds them and sets them back in their bed, they sit up wobbly, ball their little paws into fists, and clean and clean and clean their little faces. She says they are so cute sometimes she almost can’t stand it. So we’ll see. I guess if you can understand that in our family we even love mice, maybe you can cross some fingers for these babies and for Older Daughter. Andrea felt like the garage sale went ok, but she had hoped to bring in more dollars. So - since her three Wisher kitties were celebrating their birthday this month, Andrea decided to make that celebration into a way to raise money for Winnie’s Wish. She posted on her blog yesterday that the three-kitty birthday party would include a comment-a-thon. For every comment left on her post, Winnie’s Wish will receive $1.00 (up to $100). So if you didn’t see Andrea’s post yesterday, click on over there and leave a comment. You can wish her three kitties a Happy Birthday, and by doing so you will give a gift to Winnie’s Wish. Speaking of garage sales . . . I haven’t updated in a long time about the Saturday yard sales I do for the shelter where my daughters work. The sales continue to be a big success. 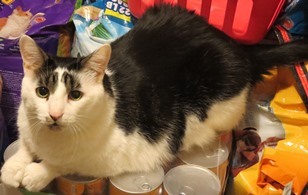 It’s been a while since Winnie’s Wish took in much because I have nearly exhausted my supply of sellable “stuff.” But the shelter takes donations of “stuff” from anyone who wants to bring it. So we get a steady supply of things to sell, and the yard sales are making a nice “extra” income for the shelter. That makes me really happy. See you tomorrow for a “tiny” Wildlife Wednesday. Growing up at Wild Angels Wildlife Rehab is about the best thing that can happen to an abandoned baby animal. The goal, of course, is to grow these babies up and ready them for release. Here are the pictures of progress. Look closely at the tails. Three people face dozens of animal cruelty charges as 91 dogs are found in dreadful conditions at a home in F --- County. Police arrested T C and her two adult sons, in their 30’s. Most of the dogs rescued were brought to the PAWS (Protecting Animal Welfare Society). The dogs came in malnourished and skinny, matted and covered in feces. “Even pictures don’t quite wrap your head around it,” PAWS Founder and President said. F--- County Animal Control said a call from a neighbor came in about a foul stench at a home and they discovered something unimaginable when they went in the home. The outside the home is described as filled by overgrown grass. The inside had dogs packed into crates with some left in the dark basement. The only soft thing to lay on for the dogs was feces. One dog didn’t have a paw and two others were blind at only two years old. R said all the dogs are going to no-kill shelters across Illinois. And that’s where our shelter came in. When we got there, my daughters picked the five dogs we had room for. Two of the five were seniors. One had bad skin. 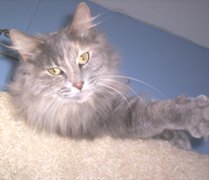 Two others had longer fur and were badly matted. The fifth was partially blind. I couldn’t have been happier driving back with these five dogs. Imagine what life has been like for them. Knowing that so many had already been accepted into shelters across the state, and knowing that these five were now going to our shelter . . . it brought me so much comfort. The other great thing is that while we were at the facility, a volunteer told us that there were still more shelters coming to take dogs. The goal is to get all 91 into shelters where they will have a chance at adoption. Let me introduce you to our group. This is Clementine. She is a senior. Her skin is terrible and she’s too thin. She is also shy and timid. This is Myrtle. She, too, is a senior. She is sweet beyond imagination. There is no doubt that she smiles - ALL the time. I can’t wait until she is adopted into a Forever Home where she can be showered with love. Mack is a long-haired dog who had lots of mats. Luckily we didn’t have to shave him. We were able to cut out the mats, and after his bath he looked great! Michael is the long-haired dog who was matted to the point of pain. We got him shaved and bathed. I’ve seen severely matted dogs; Michael is in the top three for how badly matted he was. As we started shaving him, we realized that the mats on his back were the LEAST offensive mats he had. Underneath and down his legs were mats as big AS his legs. His comfort level has gone way up. Now he just needs to grow his hair back and he’ll be so cute! Finally, there’s Heath. I’m massively in love with this guy. 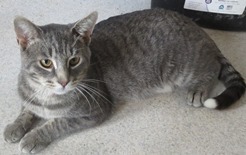 We noticed something “different” about him when we were at the Animal Control Facility. I mentioned to my daughters that he didn’t seem to be seeing well. As we watched, we realized that he only has very limited sight. He is afraid of everything because he has to depend almost entirely on his hearing and sense of smell. He stays very low; when something frightens him, he goes all the way down to his belly. He needs a very special human in his life. Ninety-one dogs in deplorable conditions. Now they have a shot at The Good Life. Keep your fingers crossed, Friends. And now more reasons to keep your fingers crossed . 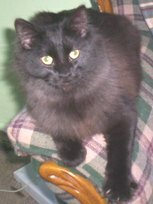 . .
Lou (I wrote about him on this blog a couple of weeks ago) has gone to a second trial home. 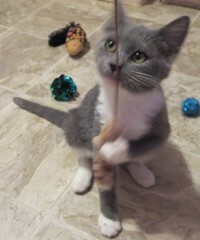 I wrote last week about Zane (one of my foster kittens) going to his Forever Home. 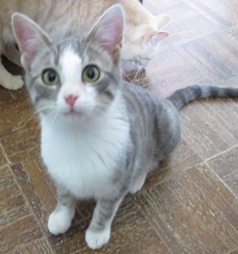 Well, another of my foster kittens – Wally – has gone to a two-week trial home. Yippee! See you tomorrow for a quick Wildlife Wednesday. One of my foster kittens was adopted from the shelter. I had the group - Wally, Tigger, Tiger, Arlo and Zane. Zane was the black-and-white one. And he has been Chosen. This couple went into the kitten room at the shelter and interacted with the kitties. They fell in love with Zane, and once their application was approved they came immediately and picked him up. Yay! 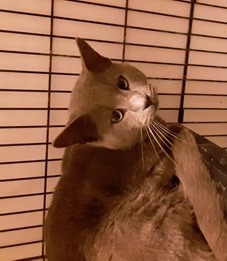 Unfortunately, I have to report that Lou (whom I wrote about last week) has been returned to the shelter. She had gone to a home for a two-week trial, but she growled at the dog already in the home. That’s OK. This is information. My daughters will now try to get Lou into a home with no other dogs. It’s also quite possible that Lou can get along with other dogs, just maybe not that particular one. So fingers still crossed for Lou’s perfect Forever Home to come along SOON. Next I want to share a picture of a gift that arrived here for Winnie’s Wish. It has been a long time since a Wish List gift has been delivered to Winnie’s Wish. It was exciting to receive it and so deeply appreciated. This gift came from Alyssa – who adopted her Bobo from Winnie’s Wish. Alyssa, Bobo, and Family – THANK YOU. Also Ginny – THANK YOU for your continuous support of Winnie’s Wish and Wild Angels. 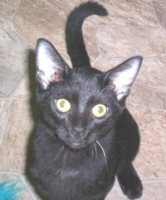 Finally – some time back Andrea (Celestial Kitties blog) sent a check to Winnie’s Wish. Anyone who reads here knows how impressed I am with Andrea’s many talents. And if you read here regularly, you know what a HUGE supporter of Winnie’s Wish Andrea is. She uses her talents to make things; then she sells them and gifts the money to Winnie’s Wish. Being at maximum capacity, I can certainly use the help. I would have announced on this blog about the check I received from Andrea back when I actually got it. But Andrea has been having loads of computer problems and couldn’t get pictures of her creations to me. I told Andrea that I wouldn’t post about this until I could show off her work. Below are the pictures of the various items Andrea made. These were special order items. The proceeds (rounded up as always by Greg, Andrea’s husband) came to Winnie’s Wish. Andrea (and buyers of Andrea’s creations) – THANK YOU. I know yesterday’s story about Lou was sad. 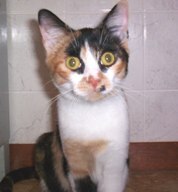 But now that she is at the shelter, she has a chance at a loving Forever Home. I’ll keep you posted. Today’s story is sad, too. But the happy ending is included. Usually, Older Daughter gets her abandoned and injured wildlife from people in various situations who have the compassion to look for help. They discover Wild Angels Wildlife Rehab and give Older Daughter a call. Last Saturday, however, it was Older herself who found the needy animal. As she told me the story, I found myself choked up with tears – sad tears, and happy ones. I mentioned yesterday that this past Saturday I had a yard sale for the shelter as I do most Saturdays. Older Daughter had texted that she was on her way to work and she would see me when I got there. Younger Daughter rode in with me because we were due to be there at the same time. I guessed that Older Daughter was about five minutes ahead of us. Younger and I were driving along, talking, when we came over a small hill and both of us went silent. We saw Older Daughter’s car pulled over on the side of the road – facing us. My brain did the super quick assessment – it wasn’t an accident nor car trouble. Both Younger and I said at the same time – must be an animal. I slowed down as we passed and called out the window – Do you need us? The answer was no so we drove on. I knew when we all arrived at the shelter we’d be able to ask (or see) what it was. Here’s the story. Older saw an opossum on the shoulder of the road. It looked dead and there were dead baby opossums scattered around. None of us leave something like that without checking to make sure. So Older turned around and pulled over. Mom opossum was, in fact, dead. The scattered babies were dead, too. But just to make sure, Older checked the mom’s pouch. Inside was a dead baby, and another, covered in blood, but alive. It was clinging to the edge of its mother’s pouch – just clinging there, with no idea what to do but stay with mom. That’s the part of the story that had me choked up. The poor little baby, the only survivor – with no way to make it on its own. Older said he was covered in mom’s blood and very cold. She held him the rest of the way to the shelter. There was already a plan that could be implemented immediately. Older is currently traveling with her incubator. She has the two little opossum babies that were brought to her by Animal Control not long ago. She got to the shelter and got her incubator in and set up. Then she cleaned the blood off of the new baby and got him into that incubator. The two already living inside were a little bigger than the newly orphaned baby. But that wouldn’t matter. This little guy would be able to sleep with these as he was used to – instant siblings. The tiny new one is all the way to the right. Several times that day, we all three talked about how amazing it was for this one little baby to have survived – even more amazing that he was discovered and is now safe and well. *Special Note – I just found out that the very sad Lou (whom I introduced you to yesterday on this blog) has gone to a two-week trial home. I’ll keep you posted. 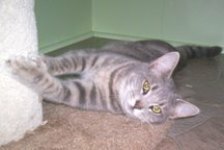 Over the years, I’ve mostly blogged about animals I’m trying to rescue or have rescued and are living here or are fosters for a while. 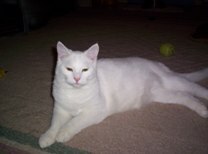 But occasionally, I’ve blogged about an animal that will never be in my home or on my property. It’s usually when I’ve learned of an animal who has so touched my heart that I have to write about it in order to process and move on. Such is the story today. This past Saturday, despite the nearly unbearable heat, I went to town to have a yard sale for the shelter where my daughters work. To get to the refrigerator in the shelter, you have to walk through one of the dog rooms. I always talk to every dog in that room, often walking over to each one. On Saturday, I noticed some new faces. I went to each one to say hello. A couple of German Shepherds, three very small dogs (two of which looked to be twins), and a chocolate lab mix. Everybody was barking and jumping and begging for attention as I went from dog to dog. When I got to the lab, I noticed that her bowl of food was untouched. She was sitting against the wall with her head hanging down. A volunteer walked through and I asked about this dog. Oh, she came in yesterday and she’s really sad. I made a mental note to ask my daughters about this one. Right away I found my daughters and asked – So what’s the story on the chocolate lab mix? They told me the story, and I immediately wished I hadn’t heard it. This dog wasn’t abused. She had not been through any trauma in her life up to that time. But my heart was deeply broken anyway – as was hers. The previous day a man had come to the shelter. He said he had his lab that he needed to give to the shelter because they just didn’t have time for her. Older Daughter went out to the man’s vehicle; the dog was in a crate in the back of the truck. He got her out and clicked on a leash. He told Older that her name was Lou. Older asked what vet work she’d had. Uh, I don’t really know – he said. So Older asked – Oh, well did you just find her? 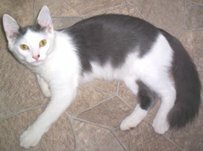 Was she a stray? His response - No, we had a dog about three years ago have a litter of pups and she’s the one we kept. As they were talking, they were walking to the shelter entrance. Lou was walking alongside her human with a spring in her step and her tail wagging. When Older took the leash and started inside with her, she looked to see where the man was, and when she saw that he was leaving, she stopped immediately and started towards him. Older tried to get her on through the door so she wouldn’t watch him leave. She didn’t want to go with Older. She tried to get to the man. The man never looked back. When I saw Lou the day after she’d come in, she was depressed and so so sad. Her head hung. Her tail did not wag. When the yard sale was over, I went into her area and offered her a milkbone. She gently took it from my hand and put it on her bed. I sat beside her and broke the treat into pieces. She slowly ate them. Then I reached over to her bowl of food and put a tiny pile of dog food pieces on her bed. One by one, she ate them. I patted her head and started telling her how beautiful she was and how much I loved her. The German Shepherds in the area next to hers scared her. So I went and found a blanket and a volunteer brought me some clips. I was able to hang the blanket between the two areas so that she couldn’t see the Shepherds anymore. After she ate a few more bites, I just sat on her bed and petted her. When I left, I turned back to say goodbye. The very end of her tail wagged, gently hitting against her bed. I went back in and sat with her some more. And I thought my heart would tear out of my chest when I finally had to leave. Lou had known only ONE home since she was born. She thought her humans loved her and wanted her. She was perfectly happy to walk on the leash with the man. And then all of that disappeared. I plan to do a shortened version of this story on the shelter’s Facebook page so that maybe someone out there will fall in love with Lou. I wish with all my heart that the next time Lou falls in love with a human, she will be able to stay with that human for the rest of her life. 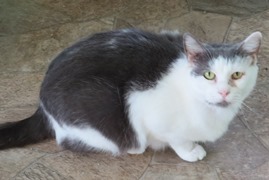 My wish is for Lou to have a wonderful FOREVER home soon. Wish with me, Friends. See you tomorrow for a Wildlife Wednesday. 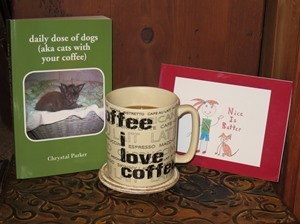 Visit my Amazon Author Page. Book sales help me continue the rescue work. 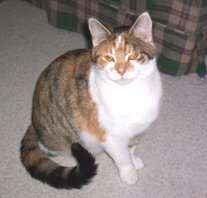 This blog was about dogs and cats for many years; now it is mostly about cats. 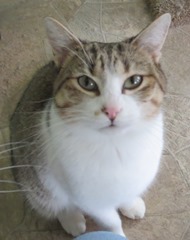 It is the home of Winnie’s Wish Cat Sanctuary. 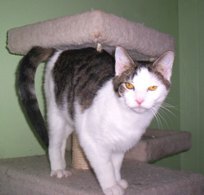 You can scroll down to see pictures of the Winnie’s Wish cats and kittens who were adopted over the years. 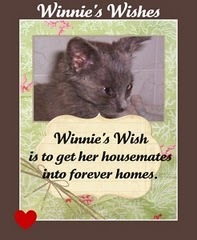 Click here to see what Winnie's Wish is wishing for. Buy the book to read stories of rescue and hope. 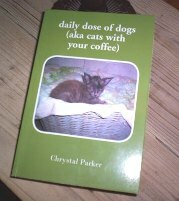 Selling books means I can help MORE homeless dogs and cats. Click here to buy the book from Amazon or B&N. Click here to order the book directly from the publisher. THANK YOU so much to everyone who has donated. Please click on the Facebook badge below and Like daily dose on Facebook. Thank you! Click on the picture to read about Winnie's Wish. 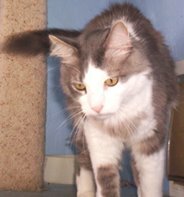 THE FOLLOWING CATS HAVE FOUND THEIR FOREVER HOMES. 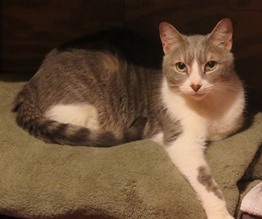 The following cats have found their forever homes and are busy living The Good Life. 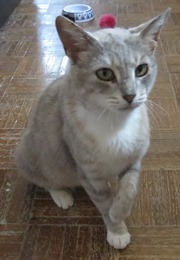 Kismet has found his forever home. Finn has found his forever home. 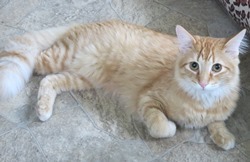 Arthur has found his forever home. 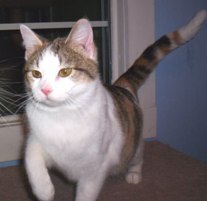 Silly Whim has found his forever home. Zen has found her forever home. 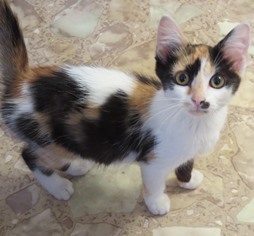 Annie has found her forever home. Betty Lou has been adopted. Traci Mae has been adopted. 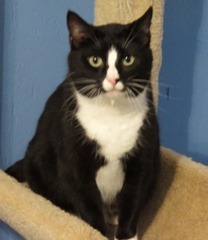 Hope has been adopted into a wonderful, patient forever home. 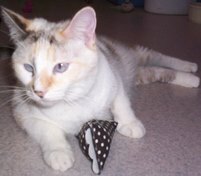 Sugar Cookie has been adopted. 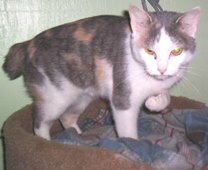 Autumn has been adopted. Click here to read why Autumn's family says It Was Worth It. 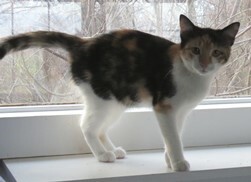 Circe has been adopted. 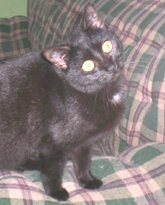 Click here to find out why Circe's family says It Was Worth It. Teddy has been adopted. Click here to read about why Teddy's family says It Was Worth It. Truly has been adopted. Click here to read about why Truly's family says It Was Worth It. Shiloh has been adopted (with sister Truly). Click here to read about why Shiloh's family says It Was Worth It. 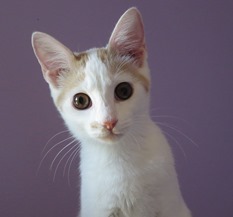 Frosting has been adopted. Click here to read about why Frosting's family says It Was Worth It. Hershey Bear has been adopted. Click here to read about why Hershey's family says It Was Worth It. 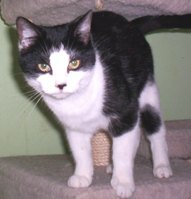 Jo-Jo has been adopted. Click here to read about why Jo-Jo's family says It Was Worth It. 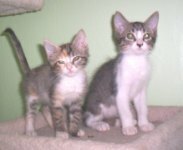 Sunshine and Juice have been adopted. Tulip has been adopted. Read about why her family thinks It Was Worth It. 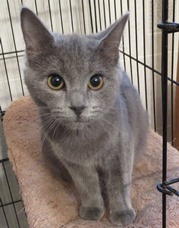 Luna has been adopted. Click here to read why Luna's family says It Was Worth It. 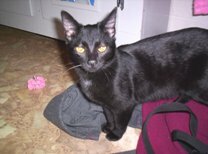 Bagheera HAS BEEN ADOPTED. You can read why his family thinks It Was Worth It by clicking here. 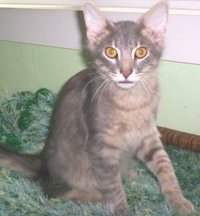 Elfin has been adopted. 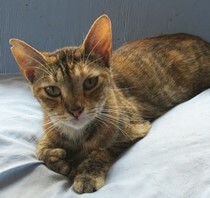 Click here to read about why Elfin's family thinks it was worth it to adopt a Winnie's Wish cat. 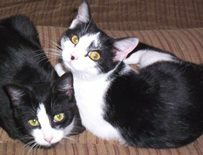 Jasper and Soapy have been adopted. 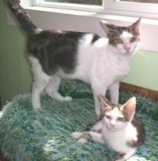 Dearest and Max have been adopted. 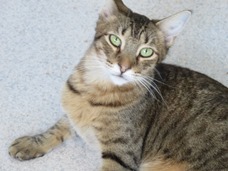 Handsome HAS BEEN ADOPTED. Click here to read about why his family says It Was Worth It. 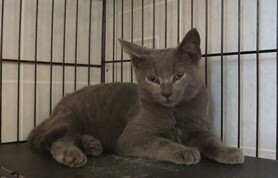 Possum HAS BEEN ADOPTED. Read about why his family says It Was Worth It. 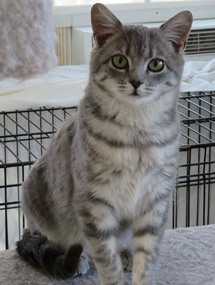 Alice HAS BEEN ADOPTED. Click here to read about why her family says It Was Worth It. 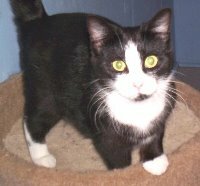 Tuxie HAS BEEN ADOPTED. Click here to read about why her family thinks it was worth it. Ash has been adopted. 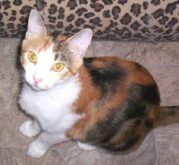 Click here to read a post about why Ash's family thinks it was worth it to adopt a Winnie's Wish cat. Prince Charming HAS BEEN ADOPTED. To find posts from months not shown here, click on the word ARCHIVES and you will be taken to ALL archives.